alaTest has collected and analyzed 51 reviews of Kenmore 12 Cup Programmable Coffee Maker, White. The average rating for this product is 3.2/5, compared to an average rating of 4.4/5 for other products in the same category for all reviews. Views about the reliability and maintenance are on the whole positive. The design and usability are also mentioned favorably, but there are some negative opinions about the noise. We analyzed user and expert ratings, product age and more factors. Compared to other products in the same category the Kenmore 12 Cup Programmable Coffee Maker, White is awarded an overall alaScore™ of 77/100 = Good quality. Great product. My coffee is hot and fresh when I wake up!!! This Kenmore coffee maker helps me everyday!!! I love my coffeemaker. No problems. The price was good. It is for the basic coffee but that is ok.
Kenmore 12C Prog. Coffeemaker is great value for low cost. 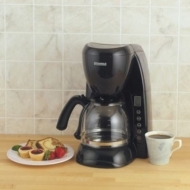 Kenmore 12-cup Programmable Coffee Maker works great.